I know you’ve seen the person who likes to boast about his or her achievements all the time. In general, I think you need to let your results do the talking. Let me give you another scenario. I knew a guy one time who wanted everyone to think he was wealthy. He was in decent shape financially, but not what I would consider truly wealthy, , , he had a mortgage and two car loans. Someone who is truly wealthy doesn’t owe for his home or automobiles. Something else, a truly wealthy person doesn’t try to convince you he is wealthy, , , he already knows it and probably doesn’t care what you think. When someone tries to constantly tell me how good they are, I tend to be a bit skeptical. On the other hand, when someone shares information and speaks to the quantifiable results they are getting, , , the results tell me this person is successful. It’s not bragging when you share results or communicate key measurements. Communicating these things is a responsibility you have. Failing to communicate your successes is actually a weakness and does not support your team the way you need to. It’s bragging when you try to suggest you are accomplishing something you really aren’t or you are trying to one-up the next person. No one really cares for the bragger, , , but they respect someone who gets results and can show it with specific measurements that can be validated. Successful people don’t go around trying to convince others they are successful. They already know this and are content to let others judge them based upon the results they can show. If you conduct annual employee performance reviews, it can be somewhat challenging to develop the review unless you can remember the things that took place for the past year for the employee you are about to review. Here is a simple tip that can not only help you create a higher quality employee review, , , it will also make it easier and faster. What a concept, , , better, faster, and easier! Start by creating a file folder for each employee who reports to you. If you have 12 employees, that’s 12 manila folders. This will take only a couple of minutes. Next, put in each folder a sheet of paper with the employee’s name and the current year, , , or the date range by which the next review will cover at the top, , , something like the example below. 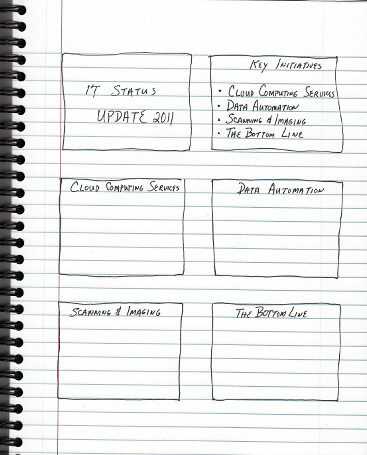 Add a note to the employee’s “Employee Review Notes” sheet in his or her folder so you can remember the event. When you fill up a sheet, add another one. Get into a habit of dropping things into your employee files that reflect something about an employee’s performance. Things like a note about a nice phone call from a client, , , a mistake the employee makes, , , a positive thing you see the employee take initiative for, , , anything that can tell you later about your employee’s performance. Believe me, this only takes a few minutes a day, , , or you can spend 10-20 minutes at the end of each week to do it. The point is that at the end of a year, you aren’t going to remember much of what happened 10 to 12 months ago. You will tend to remember the things that take place in the most recent 60-90 days, , , and that could be good for the employee but it could also be bad. At a minimum, it tends to skew your thoughts toward the end of the performance review period. You need to consider the entire body of work over the past 12 months, , , not just the most recent months you remember well. Believe me, , , having these notes when you sit down to develop the employee performance review will be a big time saver and help you develop a much better review for your employee, , , and you will have specific examples to discuss with him or her. Not only that, , , I guarantee you the first time you sit down and look at the notes accumulated for an employee will probably shock you. You have never had so much material to work with when developing an employee review. Ever had a couple of employees who don’t get along with one another? If you manage people for very long, you will encounter this at some point. My attitude is that I don’t think people have to like one another, but they do have to respect and work with each other. So what do you do when you have two employees who aren’t getting along? First, try to understand the dynamics of what’s going on. If you have a work behavior or personality traits tool, it can give you quite a bit of insight. For example, I had two managers who were not getting along and could not for the life of me figure out why. They were both competent and I thought they should be doing great together, , , but not so. Their work behavior profiles pointed out what was going on. One of the managers was significantly more detail oriented than the other and she wasn’t getting enough detail from her counterpart. When this happens, high detail people think the other person is lazy or not smart. The fact was that both were very hard workers and very smart. When I outlined the issues for them, their attitude toward one another improved and they began working much better with one another. Sit down with the two employees and discuss what’s going on, , , get it out in the open and create the opportunity for them to work it out. It’s also appropriate for you to expect them to work out their differences. Another thing I do is that when we have some kind of group event or contest, , , the two people who aren’t getting along always get paired on the same team so they have an incentive to help one another. These two people may never like one another and become best friends, but they do have to work with one another and respect each other. Let’s say you are the senior IT manager for a small company and your CEO has asked you to present an IT update for the Board of Director’s Meeting next week. If you are like me when I first encountered such an opportunity, there may be some initial shock. After the panic leaves you, it’s time to prepare, , , where do we start? Anything specific you need me to cover? What’s the background of the Board Members? What’s the objective or goal of the presentation? Once you know what the objectives are and what your CEO wants you to cover, you should be able to identify the appropriate content to develop a presentation. That’s actually the easy part. You also now know how much time you have, , , let’s say it is 30 minutes. You need to get a feel for the type of people on the Board. Is this a group that usually lets the presenter walk through a presentation and asks questions at the end, , , or does it have Members of the Board who ask questions every step of the way. The latter will eat up your time quicker than a bee can dart past your nose, so you need to know that this group can only absorb a little information. In fact, that’s an important piece of information for presenting to any Board of Directors. In general, members of the Board of Directors are high level and mostly concept people, , , not highly detail oriented people who want to get into the muck. But, there are some who like to get into the detail so learn from your CEO what type of audience to expect. For an audience who waits to ask questions at the end, , , count on 1 -2 minutes per slide, , , that means you can deliver 10 to 12 slides at most and still have time at the end for questions and discussion. For the interactive group who asks lots of questions, consider 3-5 minutes per slide, , , that means you can only get through 5-8 slides comfortably. What to cover is very important to know from your CEO. He may want you to deliver a general overall view of what’s taking place in IT for the company, or he may want you to spend the majority of your time to provide an update about a specific IT initiative the Board is interested in. Once you know what the presentation objectives are and the subject, collect the data you need to develop a presentation. It might include recent management reports, cost justification analysis, project status updates, etc., , , whatever data you have that supports your topic and allows you to develop a few PowerPoint slides to discuss the subject. It is also reasonable that every bit of the material could come out of your head, , , read on. At this point, step back and put yourself into the mindset of your audience. In this case, the Board of Directors represent the owners of the company, , , so what would a company owner want to hear about this subject you are about to present? 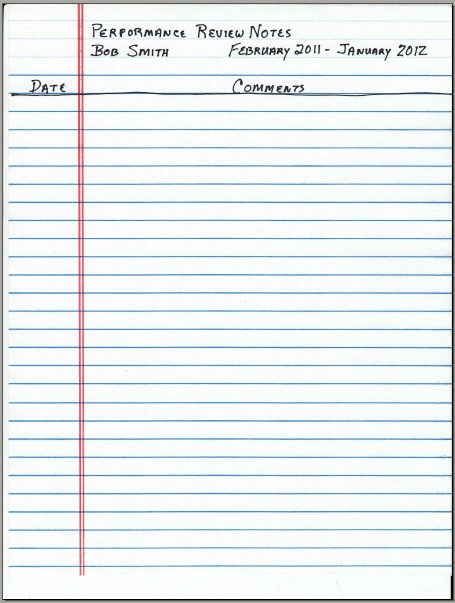 Make a quick list of what you think they would want to know about. Ask your CEO or the meeting sponsor the question and gain their insight, , , always helpful. When completed, think about key points you think are important to share. Make another list. Now, you have a list of what the audience wants to hear and important points you believe need to be presented about your subject, , , plus you have supporting material by which to start developing slides. Each of your slides needs a title, , , this is sort of like an outline of a book if you were writing a book. What I do when I plan to write a book is start by developing the Table of Contents, , , this is my book outline. A PowerPoint presentation works the same way, , , each slide is a key point you want to make as you walk through your subject, so create a title for each slide. 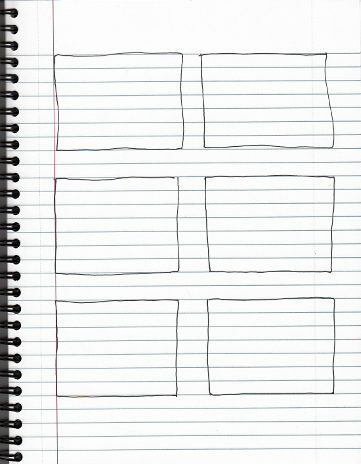 A quick and easy way to do this is to take a blank sheet of paper and draw a set of rectangle squares , , , I usually put 6 to 8 boxes on a sheet of paper. Each box represents a slide in your presentation. Now, put the title of each of your slides in the top part of the boxes. I work left to right and to the bottom in the sequence I want my presentation. Going into this process, you may not know how many slides your presentation will be or in exactly what order. Creating a paper draft makes it easy and creates thought as you work through the process. When finished with identifying your title slides, check the number of slides and be sure you have ample time to present the content you are going to end up with based upon the guidelines I discussed earlier. Once you get the slide titles defined, the rest is fairly easy, , , creating bullet points for each slide based upon its title. When you start developing the detail of the slides, you may identify new slides you need to add or possibly slides that can be better discussed by combining them. The point is that the finished presentation will be slightly different from what you think it will be as you start working on it in the beginning. Next, put in the bullet points for each slide on the paper to complete the draft of your presentation. A couple of key things to remember. First, you need to resist your urge to provide too much detail. In a slide presentation, too much detail makes it difficult for people to follow. Use short and crisp bullet points that you can talk about. Next, keep the number of bullet points on a slide to a reasonable list, , , no more than 4 to 6 points on a slide. Anything over that is too much detail. Finally, a single point and graphic on a slide can be a powerful message so focus on highlights, , , not detail, unless of course your CEO says he wants you to discuss the detail. When you are comfortable with the presentation “draft”, create the PowerPoint slides using the presentation template needed to make it consistent with your CEO’s presentations look and feel. As you build each slide from your paper draft, think about graphics that add value to the presentation or make your points easy to follow. Don’t be too cutesy, , , but good graphics can add a lot. As you build the slides, you will also make adjustments to your bullet points because you will think of things that need to be in the presentation. Another point about graphics, , , senior executives love charts and graphs that make your message visible. A good chart showing positive progress can add tremendous value to your presentation. By drafting the presentation on paper first and then building the PowerPoint slides from the draft, it allows you to walk through the presentation a couple of times, , , and this is always helpful for your thought process and will ultimately make the presentation better. Let me repeat something here. Fight your tendency to provide too much detail, , , we want the major points, , , just the major points. Fewer bullet points is better than lots of bullet points. Remember, these guys are high level, , , they want the answer, not all the detail. If they need detail, they will ask you questions and you can fill in the blanks. IT people think everyone needs all the information possible. Just the opposite is the case, so keep your presentation at a high level, , , and use graphics to enhance the message. Prepare a good opening to get things started smoothly, , , it will help calm your nerves. Rehearse what you plan to say and become intimately familiar with every slide you present. Anticipate questions you may be asked and come up with appropriate answers. Develop a list of key message points you want to make for each slide. This can help you stay on message and insure you emphasize each key point. Prepare and you will come across knowledgeable and on top of your game. Go in there unprepared and they may rip you apart, , , so be prepared. How do you change the perception of people in order to take on more responsibility? People’s perceptions, especially senior management’s perceptions, are made up by the results we achieve, how we achieve them, and how we conduct ourselves. 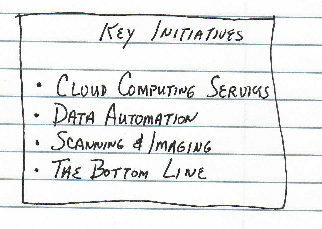 It really is a combination of each of these things, , , not just a matter of getting the job done. Don’t underestimate the significance of “how you go about your work” and “how you conduct yourself with others” plays when senior management starts looking to promote someone. If you aren’t getting assigned additional responsibilities and you think you should be, take a step back and try to objectively assess what the manager sees in your performance. You may be getting results but possibly the manner in which you are getting your results is not quite what senior management wants to see. It may also be that you aren’t getting the results they expect. Are you setting the right tone in terms of teamwork? Are you creating positive energy for those around you or is it negative energy? Are you creating the right role model image senior management wants? All of these questions are worth asking yourself, , , and when you answer them, , , be objective and honest with yourself. Ask your senior management why you are being passed over and ask in a non-confronting way. Be open to what they have to say and listen objectively. You may not like what you hear, but it is their perception that you have to deal with just like dealing with an unhappy client. Don’t try to rationalize or defend yourself, just listen! 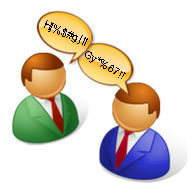 Don’t talk, , , LISTEN !! Listen to what they have to say and incorporate their input into your approach to do a better job, whether doing a better job is getting better results or changing how you go about getting the results. My career took off when I stopped pushing senior management to give me more responsibility and to do more for me. Up until November 1986, my approach was all about me. I couldn’t understand why I wasn’t getting more promotions, more money, more responsibility, , , all the things I thought I had earned. Then, in November 1986 our company had a major reorganization. I was assigned a management responsibility for a small technical support group of 22 people supporting 23 clients. My focus changed almost overnight although I didn’t realize it until much later. I started focusing on our clients and my employees to achieve some specific company objectives, and I was working so hard on this and having so much fun, , , I forgot about “me”. When I truly focused on doing a great job for our clients and the company and started getting results in those areas, more responsibility just started coming my way. I suddenly became promotion material and was getting more and more responsibility when it seemed that I wasn’t even trying to get more responsibility. Sometimes, you just have to “let it happen”. It seems to happen easier when you aren’t pushing so hard. In hindsight, it was about results and also about how I approached my responsibility. My perception of myself before the reorganization was very different from my senior manager’s perception of me. I thought I was getting great results, but the reality was I was probably getting meager results at best. And I was always pushing for more every chance I got, , , and this created a negative vibe that I didn’t realize. After the reorganization, the results were specific, quantifiable and matched up with what senior management wanted. It also helped that these results were visible, , , they have to know about it to appreciate the effort. Our monthly reporting processes communicated the results in an objective fashion and it made a difference. First, raise your perspective to a senior manager level. They want managers to be mature and to think in terms of the client and in providing tangible business value. Being proactive in developing a strategy that’s in sync with the client and business owner’s needs is critical. Do things that reduces cost or improves productivity of groups of people and you endear yourself to senior management, especially if it helps achieve business financial goals. Second, I can’t tell you how many times I have sat in senior management meetings to discuss the need to fill a senior management position and we had to turn potential candidates down because they didn’t have anyone in their organization who could step up and fill their management position if we promoted them. To move up, you have to be able to fill your position with as little ripple as possible. When we make management changes or promote someone, we look closely at the impact it’s going to have, both positive and negative. Management Rule #1 is to identify and develop your replacement. Many managers tend to avoid doing this because they are concerned it makes them vulnerable. That’s completely wrong in my mind. Getting your replacement in position actually shows us you can develop a strong organization and it positions you to take on more responsibility. Focus on positive results and how you go about getting those results. Both are important. We all know how difficult it can be to drive a square peg into a round hole. The image on the right shows it best, , , driving a square peg into a round hole can break some things. It’s exactly the case when dealing with people, , , specifically your staff. 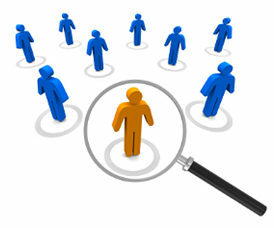 When focusing an employee you want to take advantage of his or her strengths and interests as much as possible. It makes their development easier and you will get more from the employee because they are working on things they like, , , it’s sort of like swimming downstream versus trying to swim upstream against the current. Make it a point to learn about your employee and to discover these strengths, likes and dislikes. When you tap into the strength and interest of an individual, they will work harder to learn something new and to do their job well, , , because they like it and it’s a good fit for them. It’s a common trait we all have. Things to consider are the technologies you have them focus on, the area of responsibilities you give them, the type of projects you assign them, even the people you assign them to work with. Try to make life better for people when you push them into certain areas of work. If they love what they do and have the tools to do the job, you can get powerful results, , , and that’s what we all want to achieve. 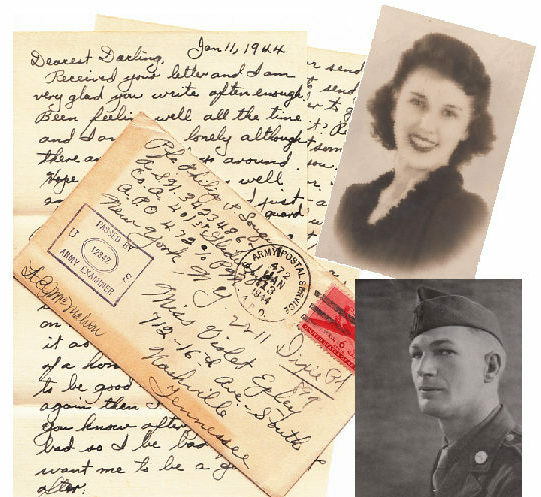 After months and months of encouragement, , , my wife, Dorine, has started a new Blog called DorinesPlace. Check it out at http://www.dorinesplace.wordpress.com/. Family is a very important thing to me and I’m extremely fortunate to have such a supportive wife and a super, fun loving son. If not for Dorine’s support, there is no way I would be doing the work I do now, , , and I love my work more than ever. She has been there every step of the way, , , in good times and bad, , , and always sees the positives of things. Last year we celebrated our 40th year of marriage. Hard to believe. Why did I want her to Blog? Pretty simple, , , Dorine is very talented and can do just about anything , , , much like her Dad could do when he was alive. Dorine paints, decorates, sews, quilts, and can create a wonderful array of things people like. Did I mention what a great cook she is? I wanted her to start a Blog because I think she has a lot to share with others and she is also one of those people who laughs a lot. Just a fun person to be around. Granted, much of her laughter is probably because of something silly or shall I say “dumb” things I do, , , but hearing her laugh is a neat thing. CLICK HERE to check out DorinesPlace, , , and feel free to leave her a comment telling her you heard about her BLOG from ITLever. I receive quite a few inquiries about how to prepare for an IT manager role. Often, these inquiries come from a parent who wants to help a son or daughter position themselves for a successful career. It’s something anyone who wants to be an IT manager one day should think about and devise a plan to prepare for. 2. Have him subscribe to my ITLever Blog at www.itlever.com so he receives free weekly tips and tools directed to helping IT managers achieve more success. 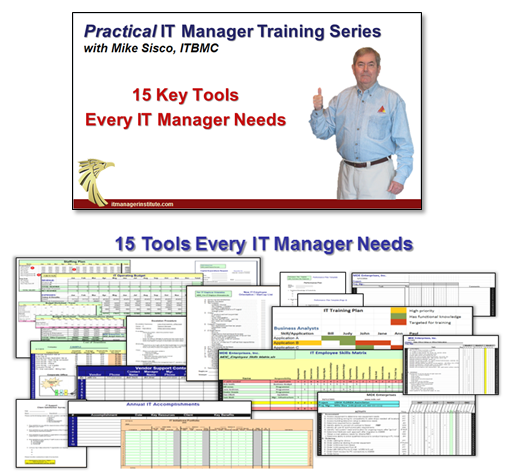 There are hundreds of free articles, tools to download and other items to help an IT manager and I add new content every week. 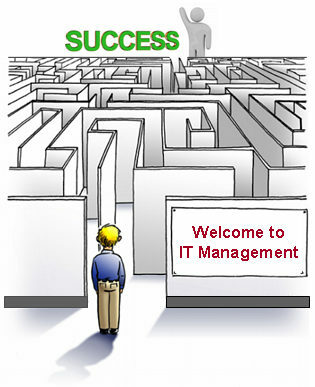 A recent ITLever post will be of particular help titled, Solve the IT Management Maze with an IT Management Process. CLICK HERE to see it. CLICK HERE for a special 50% discount offer for ITLever Blog readers – only $249.00. 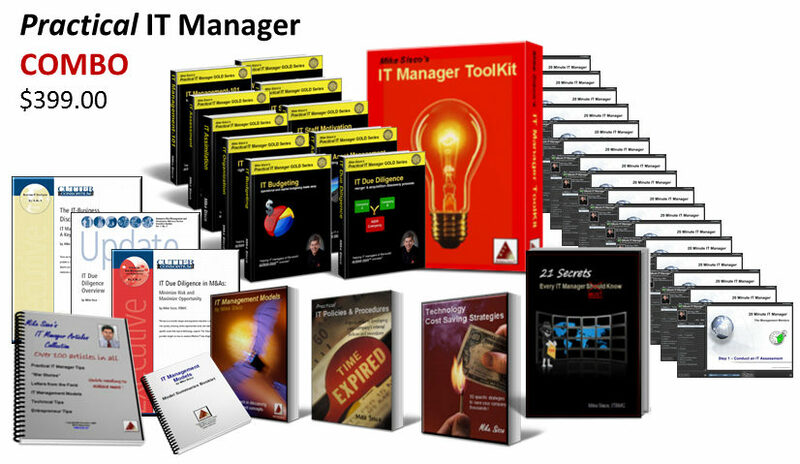 Included in this bundle are 12 sessions of a series titled, “12 Secrets to IT Success” that outlines the IT management process I use in managing technology resources. 5. If and when he truly decides to position himself for a manager role, he should attend the IT Manager Institute. It is available in classroom and online self study and includes Bonus items of all my books and tools. This class will do more for his preparation in becoming an effective IT manager than anything he will find. 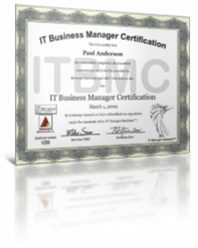 Both the classroom version and the self study are exactly the same material and lead to an IT Business Manager Certification (ITBMC) that was co-developed by Belmont University and my company to focus on the importance of IT organizations to provide tangible business value for their company. 6. Find an IT manager mentor, , , someone who is interested in helping your son learn about aspects of managing technology resources and a resource to go to for questions and discussions of interest. It is helpful to work with someone local who is willing to be a mentor at no cost, , , as long as the “mentor” knows what he is doing and has a successful track record. Poor or weak resources can actually damage your son’s career. I have plans to provide a monthly IT manager membership program to provide mentoring services and IT manager development training because of the need we have seen. 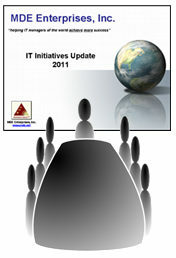 Watch my ITLever Blog or Practical IT Manager Tips Newsletter for a future announcement. Contact me at info@mde.net if you are potentially interested in a monthly IT manager mentoring program. I must warn you beforehand, , , it will not be cheap due to the effort required to set it up and it will be limited to a designated number of members. 7. Your son can gain a sense of management by managing a project. In doing this he will be exposed to people management, managing client expectations, and budgeting. 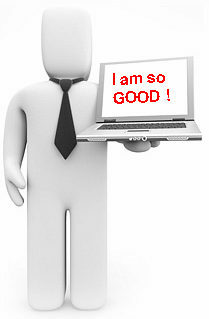 If he learns to manage projects well, it is good development for future IT management roles. I hope this is of help and wish your son the best of success in his young career. The important thing to do when preparing for an IT manager role is to start learning from someone who knows how to manage technology resources, , , and to learn about what a successful IT manager really does, , , it is not all about technology actually. 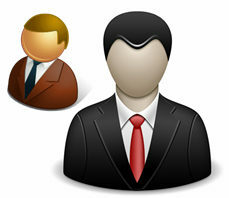 Focus only on technology and not the business and you will have major difficulty in becoming a successful IT manager. One last piece of advice is to observe others and incorporate the best of what you see into how you go about doing things. I’ve done this throughout my career and know it has made a big difference in my management career. It’s another reason why having a good mentor is so important. 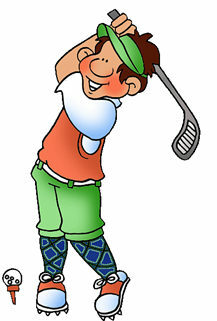 It’s said that he won a golf bet one time playing with a wrapped Dr. Pepper bottle as his only club. The point with this article is that the reason he was so good and played so well under pressure was because he practiced for it. He beat Jack Nicklaus in an 18-hole playoff to win the US Open when Jack was in his prime. Some called him lucky when he holed out from off the green on one of the final holes of the British open to win that one. I can tell you for certain that it was not luck. Lee Trevino’s short game was unparallelled at the time, , , he was just as likely to hole a chip from off the edge of the green as he was to make a putt of the same distance. Managing an organization works the same way. The more you work on your skills the better they become, , , whether it be developing a presentation, delivering the presentation, budgeting, coaching employees for improvement, , , any aspect of management. You don’t just wake up one day and decide you will be good at something, , , and there you are. To be good at anything takes some work, focus and determination, , , and you guessed it, , , practice. Practice and you will improve, , , and maybe “get lucky”. The reality is that it is not “luck”, , , you succeed because you prepare to succeed. Does this look like what you found when you first became an IT manager? If so, it’s not really surprising, , , it’s what I discovered and millions of managers around the world discover when they first get their BIG OPPORTUNITY. Managing an IT organization can seem like one big complicated maze. Well, it really is unless you have a process to follow and tools to help you achieve the things that are necessary for IT management success. In my case, I had to learn the hard way about many things, , , but I was also fortunate to have some very strong managers around me to learn from. Not all of them were IT managers, , , some had very little knowledge of technology or in understanding IT employees, , , but they possessed excellent management skills and were good resources to learn from. 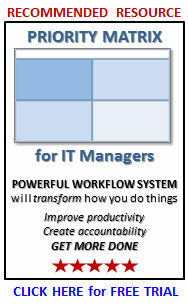 Don’t limit yourself to learning from only IT managers, , , it limits your possibilities. It’s going to be helpful to your career to learn things from company executives, sales and marketing, , , Human Resources, , , your client department managers, , , even vendor managers. What you also need is a proven management process, , , a path to follow that will help you find your way through the maze. There are obstacles at every turn in an IT manager role, , , some can even be deadly impediments to your career. 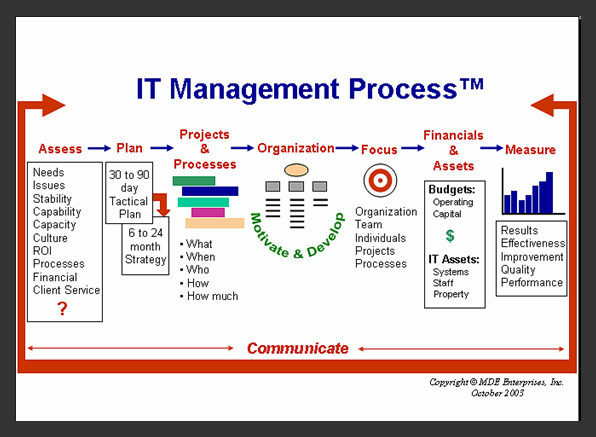 Here is the management process I use in managing an IT organization. 1. Assess – Conduct an IT assessment to determine what the business needs and issues are plus what your IT organization’s capabilities and capacity is. Once you understand the “demand and supply”, you can develop a plan of attack. 2. Plan – Develop an immediate 30-90 day tactical strategy and once you get your people focused on it you can start working on developing your long term strategy. 3. Projects and Processes – Delivering projects successfully is the key to credibility and there are key support processes you must put into place in order to support your clients effectively. 4. Organization – You must build an appropriate IT organization and when you have people, you need to motivate them and develop their skills to create a world class support organization. 5. Focus – Evert aspect of your organization needs clear focus, from the individual employee to the entire organization. 6. Financials and Assets – Managing the financial side of your business and keeping track of technology assets becomes a key part of managing a successful IT operation. 7. Measure – To improve, it is important to know where you are and whether you are making positive strides, , , practical measurements will spell it out for you. 8. Communicate – What ties it all together and makes such a powerful difference is being able to communicate well. 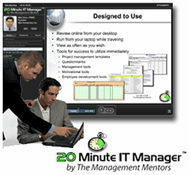 CLICK HERE to purchase the 20 Minute IT Manager video for only $9.99 to learn more. CLICK HERE for a special 50% discount offer for ITLever Blog readers – only $249.00. Attend an IT Manager Institute class or access the Self Study program to learn step by step how to become a successful IT manager.